1. Yes, we will be locking you in a Suite for one hour or until you escape. You will be provided with a means to exit the Suite for emergency purposes. 2. Depending on the Suite you choose, you may be handcuffed, blindfolded, tied, chained, transmogrified, or any combination therein. We can make your experience as real as you want. It's your experience at your comfort level. Please read Suite descriptions for details on what you can expect for each game. 3. Participants under 18 years of age will need a parent or guardian present to sign a waiver. At least one paying adult should attend minors. 4. The scenario starts whether you are here or not so the next group will not be shorted any time. There will be a short briefing before the scheduled time that your 60 minutes begins. We will break down the remainder of the scenario at the end of your 60 minutes for you if you don't escape and if time allows. It will take about an hour and a half for the whole event. 5. There is a maximum and minimum number of participants for each Suite depending on the size of the Suite. If you do not purchase all of the tickets for the time slot for that Suite then you may be grouped with others. 6. No food or drinks will be allowed in the scenario Suite. 7. 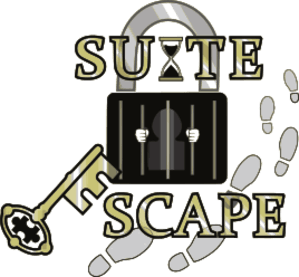 We will be taking a group picture of your success or failure for our Facebook, Instagram, Twitter and our website Suite Escape. 8. We have time slots available for group events at times that are not available in the reservation system. Use the contact form to let us know when you want to schedule your special event. You can book the facility on weekdays for a private event and choose the number of Suites to send one or more groups through during the time period you choose. You may have a meal catered or bring your own food and drink. We will work with you to help you create your own personalized experience. 9. The cost is $20/Player. There are no refunds. If you can't make your appointment, please contact us through email and we will do our best to reschedule your booking at our discretion. 10. This is not a drunk's game. Intoxicated members will not be allowed in our Suites. At all. Period. We do not have the time nor inclination to make repairs and risk ruining the game of customers booked immediately after.